Haley joined Mote's family at the beginning of May 2018. As a research technician for Mote's Fisheries Ecology and Enhancement Program she is responsible for conducting fishery independent sampling for juvenile mullet, PIT tagging them, and maintaining habitat monitoring stations. She also is part of Mote's ongoing research focused on snook aquaculture and stock enhancement. While in her undergraduate courses she was a rehabilitation technician for the Virginia Aquarium Stranding Response Program in which she monitored the stranding's of local sea turtles and mammals while also rehabilitating injured sea turtles and mammals. 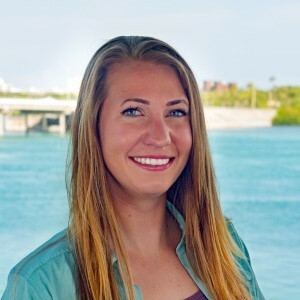 Haley also spent a summer in Clearwater, FL tagging sharks and stingrays in the Gulf of Mexico and Tampa Bay while educating students on the importance of Florida's ecology. During the last two years of her undergraduate degree Haley was a research technician for the Virginia Institute of Marine Science where she monitored the annual recruitment of juvenile striped bass and assisted PhD students in lab work regarding age and growth studies. After graduating with a B.S. in Biology, Haley left the Southeast coast of Virginia and moved back home to Northern Virginia where she assisted the Virginia Department of Game and Inland Fisheries with largemouth bass and trout monitoring surveys along with snakehead management. In August 2017 Haley accepted a seasonal position with Utah Division of Wildlife Resources where she assisted with Colorado River cutthroat trout enhancement projects. In January 2018 Haley accepted a seasonal position with Florida Fish and Wildlife Conservation Commission where she created a progressive creel data set and assisted in largemouth bass monitoring surveys while also assisting in lake management. Her extensive experience in not only saltwater, but freshwater has made Haley a viable asset to Mote's family.